I'm super excited about this. On Monday, Ulta celebrated its platinum members by offering 10x points on select products--including Urban Decay palettes! I own (and use regularly) Naked and Naked3, so I thought it would be a good time to complete the trifecta, and I ordered Naked2. I can't wait for it to arrive! This morning I was thinking about how much I love Urban Decay products and about how weird/disturbing their shade names are. But if we're being honest, isn't that part of why we love the brand? I started wondering if the shades we're most drawn to say anything about us, so I came up with the hashtag #MyUrbanDecay on Twitter. I don't have the social media clout to get that hashtag trending, but I decided it would still be a great tool for me to learn about you and your preferences. And to encourage you to join in the conversation, I'm giving one lucky reader their choice of THREE URBAN DECAY EYESHADOWS (or one eyeshadow palette)! Just follow me on Twitter and tweet your three favorite UD shades using #MyUrbanDecay. To enter, tweet the names of the three Urban Decay shades you use most (don't worry; you're not locked into these shades if you win), and make sure your tweet includes the hashtag #MyUrbanDecay. If you don't currently use Urban Decay eyeshadow, or if you'd like an alternate form of entry, you can enter by tweeting the shades or palette you would like to try. You can enter as often as you'd like. Tweets must be sent by 11:59pm PDT on Sunday, September 11. You must be following me (@wendy_b) on Twitter when the contest ends to win. The winning tweet will be chosen randomly using TweetDraw. After the winning tweet is chosen and verified, the winner will be contacted via direct message on Twitter and asked to choose three individual eyeshadow shades then available on Ulta.com. The approximate retail value of three Urban Decay individual eyeshadows is $57 ($19 each). 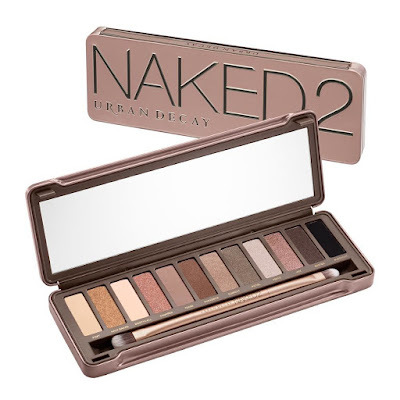 If winner so chooses, he or she may elect to instead receive an Urban Decay eyeshadow palette of equal or lesser value (such as Naked, Naked2, Naked3, or Naked Smokey), providing the palette is in stock and available on Ulta.com. If the winner does not respond to the direct message within 48 hours, another winner may be chosen. Items will ship directly from Ulta to the winner. Good luck! Winners will be selected at random. One prize per household. Entries will be verified before winners are announced. Author reserves the right to decline to award prize to an entrant if Author determines, at her sole discretion, that the winning entry was the result of spam or otherwise unfair entry practices. Giveaway is hosted by the Author of De Nouveau Review. Individuals or entities associated with the brands and products included in the giveaway are in no way affiliated with this giveaway. Author makes no warranties concerning the merchantability of goods offered. Product links provided in the giveaway blog post are for information only and Author makes no guaranty that products sent will conform with the characteristics of products represented by said links. Thanks for entering and thanks for reading De Nouveau Review!